Department of Microbiology and Molecular Genetics, University of the Punjab in collaboration with Pakistan Biological Safety Association organized Biosafety Training for Young Researchers on 28th November, 2018. The welcome note was delivered by Prof. Dr. Sikandar Sultan and Dr. Adnan Arshad . After that the formal lecture was delivered by Dr. Imran Khan Khatak on four primary control of biosafety, levels of applied Biosafety and biosafety standards. The second lecture was by Mr. Zia Ashraf which includes the basic concepts on Sterilization, disinfection, decontamination and antisepsis. The third lecture was presented by Mr. Adeel Ahmad on Laboratory Acquired Infections (LAIs) and the last lecture was Ms. Sibgha Tayyab Khan Swati on biosecurity. Practical activity was divided in four stations.The station one demonstrated about beaking and bootie dance by Ms. Samreen Sarwar. Second station demonstrated about basic practices about hand washing by Mr. Syed Ihsan Gillani. At third station was about spill management by Dr. Samra Jafri and fourth station was about waste management. 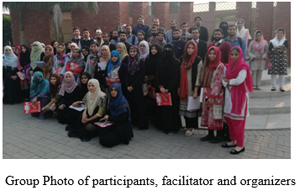 Participants from MMG, University of Sargodha, Kinnaird College for Women University, Quaid e Azam University, Government College University, Lahore College for Women University, Punjab Thalassemia Center, King Edward Medical University and Citilab and Research Centre attended the workshop. The recap of the day was given by Dr. Adnan Arshad and Dr. Saba Riaz (Focal Person). The workshop was ended with certificate distribution, post-Assessment, shield distribution and group photo.